It’s summer. In Florida that means copious amounts of perspiration and many hated weekends spent trimming up the grass and edging the lawn. What, you thought all we did here was go to Disney World? If 2-cycle trimmers are the cats meow, then 4-cycle trimmers must be better, right? I mean, they’re two more, aren’t they? 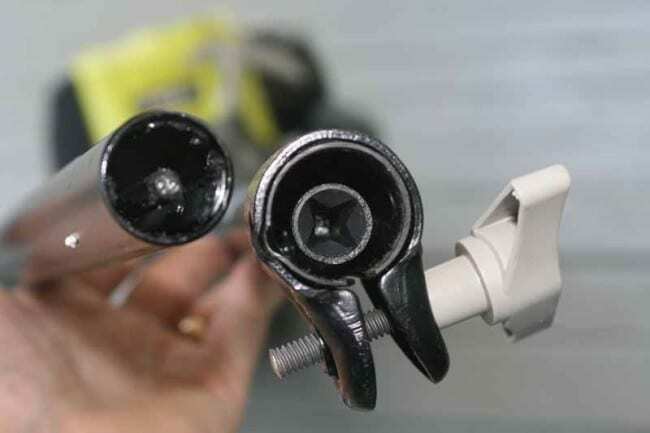 Well, the Ryobi 4 cycle trimmer offers a couple things its 2-cycle counterpart doesn’t. First, reduced noise output during idle dramatically reduces fatigue on the ears when you’re spending an extended amount of time less than a yard from a hard-working motor. Second, the 30cc engine is more powerful than most, which means you won’t bog down in thick patches of grass… which wouldn’t be all that thick if you weren’t so lazy and got out to trim more often – but I digress. The last thing a 4-cycle motor offers is separate gas and oil (engine lubricant). This means there’s no more need for pre-mixing your fuel. The Ryobi 4 cycle trimmer RY34440 promises, among other things, quieter operation and greater fuel efficiency. It’s a “green” product (in more ways than one) that indeed delivers less fuss when fueling since you don’t need to pre-mix your oil and gas. It also works with Ryobi’s Expand-it line of attachments – which are even backwards compatible with products I bought over 10 years ago. The 4-cycle Straight Trimmer comes with just the string trimmer attachment, but does include both a bump head and a pro-style head that facilitates easy string replacement and will handle larger diameter string (anything from 0.095 to 0.105 in.) Using larger diameter string will make your job easier and we highly recommend going for the largest you can find that fits the Line In Pro Cut II string head. The included Extended Reach Trimmer attachment comes with both a bump head and a pro head. After suffering through many bump heads in my time I saw no reason not to quickly disassemble and remove the bump head (on by default) and substitute the much better pro style head. This took all of two minutes and now I can buy bulk line of excessive thickness string (up to 0.105 in in fact) and cut it to length as needed. Replacing string is as simple as sticking each side’s length in place. You can even cut them a tad long as the trimmer head includes a piece of metal that will make quick work of any excessive line. 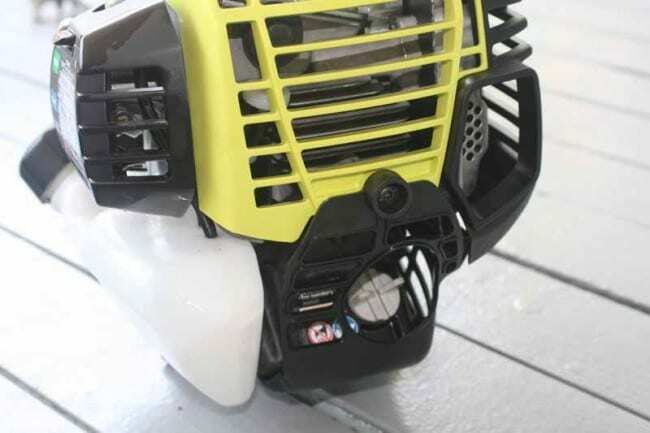 Looking at the motor you will see that the gas tank, which holds just under a tenth of a gallon of gas, is oriented such that the trimmer can be refilled while sitting on the ground. The trimmer needs to be operated and even stored in this position to avoid oil leaking out of the carburetor or muffler. On the left side, just above the tank, you’ll see the choke lever and priming bulb. The bulb looked to be well-made and is a device you will expect to replace after several years due to the fuel taking its toll on the synthetic material. Just in front of the choke is the starter grip and rope which you will undoubtedly become very familiar with when using this tool. This is a half-crank design with only a single bearing on the crankshaft. Higher quality trimmers tend to have the starter rope anchored to the back of the unit so that it can make use of a full crank shaft that is supported by a bearing on either side. Reviewer’s Note: See our article on 2-cycle vs 4-cycle engines. On the rear of the trimmer you’ll find the recessed oil cap. The cap also serves as a dipstick to let you know the oil level. It should be checked with the trimmer placed horizontally on the ground. The trimmer takes 10W-30 oil and holds 75mL of lubricant (oil) when full. Checking it is just a matter of cleaning off the dipstick and then making certain the oil falls within the hatched area of the stick. It’s important to not overfill the oil, so be careful and use a funnel (a paper one is provided for first use). We didn’t find the unit to leak all that much oil during our use, provided we kept it horizontal during storage. We did try hanging it vertically with both the engine and blade sides up. Both produced leakage from the carburetor. As a result, the only “safe” storage position for this tool is lying horizontal on the ground, properly oriented. That’s a shame as this takes up much more room than hanging it from a double hook with the engine side up (two cycle engines can be stored in this way since the oils and gas are mixed together and sealed within the engine). The oil needs to be changed after every 25 hours of use. The biggest challenge you are likely to encounter when using this tool is starting it up. It takes a few more pulls than we were used to. OK, I’m being generous… you’ll pull on it almost a dozen times before it starts. It’s not necessarily difficult per se – just tedious. The starting order involves verifying the choke setting, priming the bulb and then pulling the starter cord. You don’t apply any gas to the throttle until the unit has been running for 6-10 seconds. This ensures you don’t stall (or flood) the engine. We got used to starting up the trimmer and after a while it just seemed like old hat to us, but it definitely took more energy than any of the 2-cycle trimmers we’ve used. This is not a tool we’d recommend for most women or teens looking to cut lawns. Average time on single set of string: will depend on your string! We edged a decent sized lawn with this tool several times and really got a feel for the weight and power it possesses. Of note, the trimmer feels fairly light and the 30cc engine makes easy work of trimming even tall grass. It was a full 2 lbs heavier than our legacy Ryobi 2-cycle trimmer. We never felt the motor bog down (not even once) and in fact had to keep reminding ourselves to “goose it up” during use because the trimmer did a decent job when the throttle wasn’t even fully engaged. This is a powerful trimmer. What we did experience was a tendency to flood easily. Flip the choke into the wrong place while pulling on the starter cord, priming the bulb too much or any number of other things would cause the trimmer to run at less than full capacity. Vibration on the Ryobi 4-cycle Straight Trimmer was considerably greater than with our reference 2-cycle trimmer. The increased piston action and additional mechanical construction really takes its toll on your hands. Going back and forth between 2-cycle and 4-cycle was like night and day and we understand why 2-cycle might still be the first choice for most professionals and homeowners. Noise output during idle from the trimmer was below anything we’d heard from a comparable 2-cycle motor. We measured the idle noise output from 3 feet away at 80 db SPL. Compare this to our competing 2-cycle which measured 85 dB SPL (around 50% louder in terms of perception). At maximum throttle, the 4-cycle measured 101 dB SPL and our compatible 2-cycle (using the same string and Extend-It attachment) measured 102 dB SPL. We were disappointed to see the noise difference go away once the throttle was depressed. As with any noisy tool – if you are using it for an extended period, or it’s your profession, we recommend hearing protection. We were impressed with many aspects of the Ryobi 4-Cycle Straight Trimmer. In fact, most of our problems were not with the tool itself but the inherent limitations of the 4-cycle technology. If you are all about the environment, then this Ryobi 4-cycle’s fuel efficiency and cleaner emissions are going to stand out. The disadvantages are limited storage options (must keep it flat) and a more difficult starting process, but this is no different than for other 4-cycle trimmers. Treat them right and they will provide years of continuous use. Luckily, Ryobi has both 2-cycle and 4-cycle products available, so you’ve got some choices. We gave the Ryobi 4-Cycle Trimmer a 6/10 for performance because it delivers a lot of power within a small form factor. The difficult starting process, vibration, and tendency to leak oil when not completely upright left some room for improvement. We decided to judge this trimmer against other 4-cycle trimmers since Ryobi makes both. For value we gave it a 7/10 since this trimmer offers slightly more power and features for less than the price of many competing 4-cycle models. My Ryobi 2 cycle weed wacker was left outside in the rain, and now it dont want to start.. How could I fix this or do I have to buy another one?? I am just in the process of replacing the timing belt on the Ryobi.The crankshaft does in fact have 2 main bearings but they are in cantilever fashion(you may want to correct review) The belt sits behind the outside front bearing which I am still trying to remove.Owing to the way it is built this either requires a special tool or can’t be removed.If the unit runs low on oil because of the way it is stored the belt will stretch without the motor seizing.I would not recommend buying one of these. Don’t buy this unless perhaps you have a lot of experience fixing small engines. I had this for just a few months. Worked great about 10 times then could not start it. Finally took it to repair shop after calling Ryobi and getting no help. The repair shop told me they get so many of these in for repair and they just cannot find a permanent fix. Needless to say after it was in the repair shop they started it twice, I used it once and it is dead again. DON’T EVER BUY ONE OF THESE! Never buy a 4 cycle for anything that that isn’t going to be used flat on the ground like a lawnmowerr. The oil will always give you trouble. the perfomence engine 30 cc 4 times in the work is excelent, but this engine have defect leak oil, always leaking oil whe you work to down,if you have solutions, Although change parts of the engine i would like to repair explain me please.